If you’re looking for a drop cap letter to use with your own creative work, this floral drop cap frame would allow you to use any letter and any font. How cool is that? What’s even more cool is that this vintage letter image dates all the way back to 1651 when it was included in a book about botany. The book is beautifully lettered and written in Latin. But, the best part is it’s full of drop caps and other plant-related illustrations. This floral drop cap frame could do double duty. 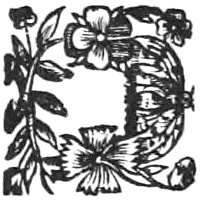 It looks a bit like a floral letter D. You could use it that way, or you could use it as the authors did as a frame for a single letter. Either way, the leaves and flowers of this black and white, vintage illustration would look great in your work.